Despite general agreement among institutional leaders that they are obligated to provide accessible technology, efforts at many colleges and universities to fulfil that promise are often ad hoc, incomplete, or not fully implemented. Including accessibility requirements or guidance in institutional policies and practices for how technology is procured is one way for colleges and universities to demonstrate a commitment to ensuring equal access to information, programs, and activities and to comply with applicable legal requirements. Due to decentralized purchasing and contracting practices, as well as the growing ecosystem of easy-to-deploy learning apps, applications and services are often deployed with little or no oversight from an accessibility perspective. Consistent adherence to accessibility policies for technology purchases can be challenging because some technologies might need to be deployed even though they are not fully accessible. Campus policies allowing decentralized technology purchases can create gray areas where buyers may be uncertain about—or may not even be aware of—their responsibilities to ensure that such purchases comply with institutional accessibility policies. Changes in pedagogic practice to ensure broader adoption of accessible technology are tangible demonstrations of that enhanced awareness. Broader adoption of the principles of Universal Design for Learning may stimulate more institutions to be intentional about policies that ensure accessible technology purchases. Accessibility from the Ground Up, by Pamela S. Hogle, offers dozens of tips for building eLearning content that more learners can use in additional ways. build in ease of access and assistance for people who are new to technology, are English-language learners, have trouble distinguishing colors, need high-contrast designs, are hard of hearing, or use screen readers to navigate or access text—all learners will benefit. Accessible content is easier for everyone to use. It is clear and easy to navigate. the type of data: wikipedia. the dangers of learning from wikipedia. how individuals can organize mitigate some of these dangers. wikidata, algorithms. youtube videos debunked of conspiracy theories by using wikipedia. lots of AI learns about the world from wikipedia. the neutral point of view policy. WIkipedia asks editors present as proportionally as possible. Wikipedia biases: 1. gender bias (only 20-30 % are women). conceptnet. debias along different demographic dimensions. citations analysis gives also an idea about biases. localness of sources cited in spatial articles. structural biases. geolocation on Twitter by County. predicting the people living in urban areas. FB wants to push more local news. danger (biases) #3. wikipedia search results vs wkipedia knowledge panel. collective action against tech: Reddit, boycott for FB and Instagram. data labor: what the primary resources this companies have. posts, images, reviews etc. boycott, data strike (data not being available for algorithms in the future). GDPR in EU – all historical data is like the CA Consumer Privacy Act. One can do data strike without data boycott. general vs homogeneous (group with shared identity) boycott. the wikipedia SPAM policy is obstructing new editors and that hit communities such as women. Facepager (open source) if not Python or R coder. structure and download the data sets. TAGS archiving google sheets, uses twitter API. anything older 7 days not avaialble, so harvest every week. social feed manager (GWUniversity) – Justin Litman with Stanford. Install on server but allows much more. legal concerns: copyright (public info, but not beyond copyrighted). fair use argument is strong, but cannot publish the data. can analyize under fair use. contracts supercede copyright (terms of service/use) licensed data through library. methods: sampling concerns tufekci, 2014 questions for sm. SM data is a good set for SM, but other fields? not according to her. hashtag studies: self selection bias. twitter as a model organism: over-represnted data in academic studies. 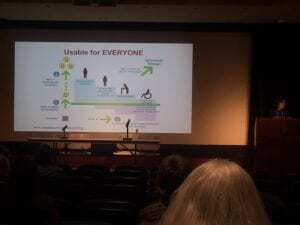 methodological concerns: scope of access – lack of historical data. mechanics of platform and contenxt: retweets are not necessarily endorsements. ethical concerns. public info – IRB no informed consent. the right to be forgotten. anonymized data is often still traceable. 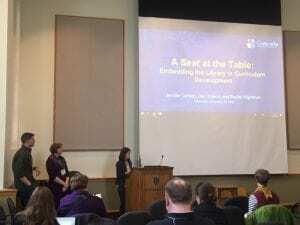 table discussion: digital humanities, journalism interested, but too narrow. tools are still difficult to find an operate. context of the visuals. how to spread around variety of majors and classes. controversial events more likely to be deleted. development kit circulation. familiarity with the Oculus Rift resulted in lesser reservation. Downturn also. An experience station. clean up free apps. question: spherical video, video 360.
app Scatchfab. 3modelviewer. obj or sdl file. Medium, Tiltbrush. 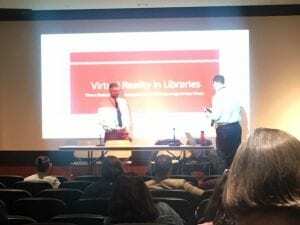 College of Liberal Arts at the U has their VR, 3D print set up. Penn State (Paul, librarian, kiniseology, anatomy programs), Information Science and Technology. immersive experiences lab for video 360. ILLiad Doctype and Language declaration helps people with disabilities. libraians, IT staff, IDs. help faculty with course design, primarily online, master courses. Concordia is GROWING, mostly because of online students. solve issues (putting down fires, such as “gradebook” on BB). Librarians : research and resources experts. Librarians helping with LMS. Broadening definition of Library as support hub. Technology permeates all aspects of today’s school systems. An Internet search on technology in schools can generate millions of website results. The vast majority of these websites (well over 8,000,000 results for one simple search) focuses on advice, activities, and uses of technology in the classroom. Clearly teaching and learning with technology dominates the literature and conversations on how technology should or could be used in classroom settings. A search on school safety and technology can produce more than 3,000,000 results with many addressing technological tools such as video cameras, entry control devices, weapon detectors, and other such hardware. However, in recent times, cyberbullying appears to dominate the Internet conversations in references to school safety. With an increase in school violence in the past two decades, school safety is a fundamental concern in our nation’s schools. Policy makers, educators, parents, and students are seeking answers in how best to protect the physical, emotional, and social well-being of all children. The proposed edited book covers the primary topic of P-12 school safety and the use of technology and technology used for fostering an environment in which all students can be academically successful and thrive as global citizens. School safety is defined as the physical, social, and emotional well-being of children. The book will comprise empirical, conceptual and case based (practical application) research that craft an overall understanding of the issues in creating a “safe” learning environment and the role technology can and should play; where a student’s well-being is valued and protected from external and internal entities, equitable access is treasured as a means for facilitating the growth of the whole student, and policy, practices, and procedures are implemented to build a foundation to transform the culture and climate of the school into an inclusive nurturing environment. Literacy and Preparedness for the Influence and Consequence of Digital Media Marketing Campaigns directed toward Children, Adolescents, and Teens. Pioneering Innovative Technology Program in Curriculum: Fostering “Belonging” beyond Athletics & Arts. Researchers and practitioners are invited to submit on or before February 12, 2019, a chapter proposal of 1,000 to 2,000 words clearly explaining the purpose, methodology, and a brief summary findings of his or her proposed chapter. Authors will be notified by March 12, 2019 about the status of their proposals and sent chapter guidelines. Full chapters are expected to be submitted by June 12, 2019, and all interested authors must consult the guidelines for manuscript submissions at http://www.igi-global.com/publish/contributor-resources/before-you-write/ prior to submission. See Edited Chapter Template. All submitted chapters will be reviewed on a double-blind review basis. Contributors may also be requested to serve as reviewers for this project. Note: There are no submission or acceptance fees for manuscripts submitted to this book publication, Leveraging Technology for the Improvement of School Safety and Student Wellbeing. All manuscripts are accepted based on a double-blind peer review editorial process. This book is scheduled to be published by IGI Global (formerly Idea Group Inc.), an international academic publisher of the “Information Science Reference” (formerly Idea Group Reference), “Medical Information Science Reference,” “Business Science Reference,” and “Engineering Science Reference” imprints. IGI Global specializes in publishing reference books, scholarly journals, and electronic databases featuring academic research on a variety of innovative topic areas including, but not limited to, education, social science, medicine and healthcare, business and management, information science and technology, engineering, public administration, library and information science, media and communication studies, and environmental science. For additional information regarding the publisher, please visit http://www.igi-global.com. This publication is anticipated to be released in 2020. Wednesday, March 13th, from 12:00 – 3:00 pm US Pacific Daylight Time (click https://www.timeanddate.com/worldclock/fixedtime.html?msg=Library+2.019+ID&iso=20190313T12&p1=283&ah=3 to see in your local time zone). This is a free event, thanks to our founding conference sponsor: School of Information at San José State University. ATTENDING: We will send links for attending the conference a day or two before the event. If you have friends or colleagues that wish to attend, this is a free event and we encourage you to share our information widely. However, please send them to the conference registration page (https://www.library20.com/instructionaldesign) rather than giving them the above link directly as it will allow us to track participation. Sandy Hirsch, SJSU School of Information. 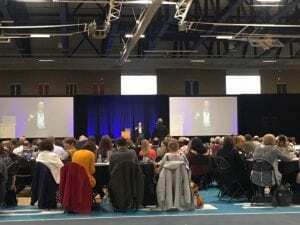 Steven Bell, John Shank – integrating ID into practice. blended librarianship. critical mass of librarians doing ID and libraries hiring IDs. 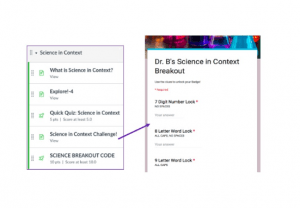 What is ID: ID create an environment conductive to students’ success. Thoughtful and applied design. Making faculty and instructors’ life easier. Allow faculty to do what they do best. Lindsey: solving the instructional problem with the tools at hand. go-to ed tech? What is the hot tech right now? areas of impact: subject matter librarians, working with faculty to use of the library resources, new faculty drawn in info and if not follow up, Canvas support. Michael: librarians and ID working directly with faculty rewriting their curricula, measure it, demonstrating library need, 3000 students – correlation. 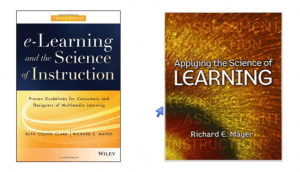 document the lib contribution to student learning directly, the teaching-learning culture change. using info and data in more authentic ways. Lindsey: disconnect the way librarian teach vs faculty teach. Coordination scaffolding. Lindsey: new to ID? Google. Jargon and Acronyms. re framing how you see ed technology. technology as something to get the job done. no need to get fancy. Dana: same as Lindsey. But also learning theories and learning outcomes. From ID perspective: what they will come out with by the end of the session. action words. Michael: mindset. what students want to learn, before what I will teach. backward design – understanding by design. UDL. Grab a friend and talk through. clickers for attendance is horrible idea. I had a really interesting role in grad school where we lived in the land between tech support and pedagogical / design support. Good to hear from mike about affective learning. In this case, could you please focus what kind of technique is approprite for what, i.e. Didactic instruction, a low-complexity teaching technique such as a “Quiz Bowl”, or Jigsaw Method as high-complexity strategy, or both. As an ID librarian and the campus LMS administrator I struggle with getting them to see that other side of my role. That I’m not just “tech support”. Anyone else? Een jsut not being tech support? I always start with ADDIE… I am formally trained in ID and am an IT trainer for librarians. ADDIE is a framework for every class I make for both live and online classes. Don’t disregard ADDIE. The Wiggins and McTighe is a great book! @Rachel, Peggy, Shane – an open source course is available. Check out the SUNY’s Quality by Design (QbD): Strategies for Effective Teaching and Quality Course Design at: http://suny.edu/qbd This course is available as a facilitated version at least once each semester and as a self-paced non-facilitated version in Blackboard’s CourseSites. 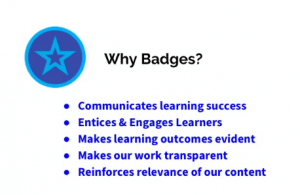 After completing the course requirements you can earn a Digital Badge to show your accomplishment. 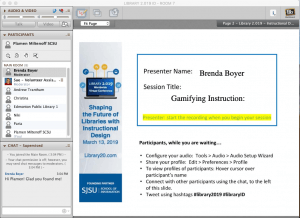 SESSION LINK – https://sas.elluminate.com/d.jnlp?sid=2008350&password=LIB2019IDPart7 — If the session link doesn’t work for you, please copy and paste into your browser. Session Title: Gamifying Instruction: Breakouts and Badges! Short Session Description: Build engagement for your online library instruction using LMS features, Breakout boxes, and digital badges. 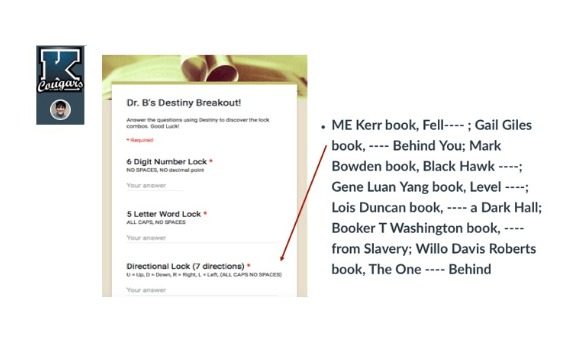 Full Session Description: It’s time to amp up your library instruction! 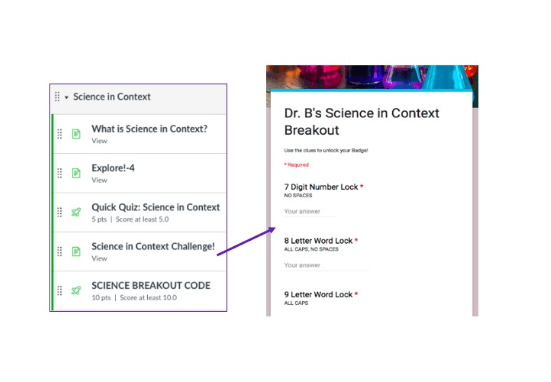 Gamifying instruction in research skills such as database usage, advanced searching, & more can increase engagement and drive independent learning for students of all ages. This session will describe how learning management system (LMS) features can be combined with digital microcredentials (i.e. badges) and breakout boxes to gamify instruction that can be otherwise deemed boring (for both the learners and the librarian!). Your Bio: Dr. Brenda Boyer is a librarian and instructional designer. 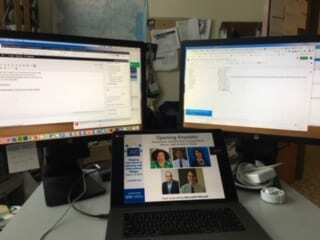 She has developed online instruction for secondary learners in the Kutztown (PA) School District, as well as for graduate and professional development learners at Wilson College and Rutgers University. She designed and instructs the Rutgers graduate course, Learning Theory, Inquiry, & Instructional Design, and is a frequent presenter at AASL, Internet@Schools. 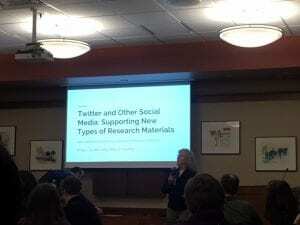 She has published articles in School Library Journal, Teacher Librarian, and School Library Connection. are we getting the job done, is our instruction sticking, what evidence we do have? differentiate: who is ready to do what” at what skill level? how to bring everybody up to speed? 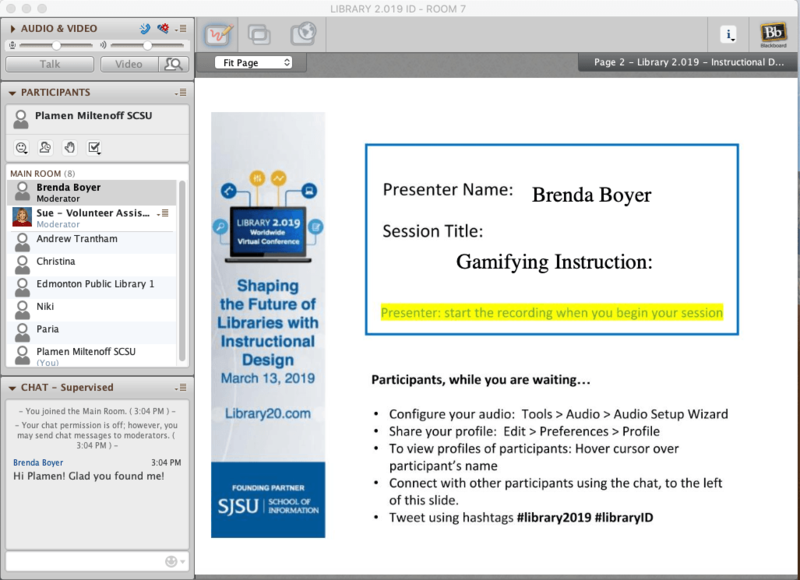 SESSION LINK – https://sas.elluminate.com/d.jnlp?sid=2008350&password=LIB2019IDPart8 — If the session link doesn’t work for you, please copy and paste into your browser. Short Session Description: This session will review Mayer’s (2001) Multimedia Design Principles to help improve instructional modules, tutorials, and videos. Full Session Description: Librarians are creating more online modules, videos, and tutorials to teach information literacy skills. 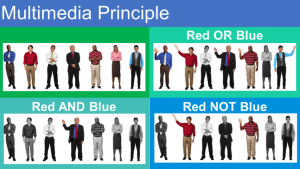 Whether designing instruction online or in-person, research-based instructional methods are required and learning Mayer’s Multimedia Design Principles is the best place to start. In this session, I will review essential prior-knowledge on image types and working memory. I will then show learners how to minimize cognitive overload using these 12 principles: multimedia, spatial contiguity, temporal contiguity, coherence, modality, redundancy, individual differences, signaling, pacing, concepts first, personalization, and human voice. Your Bio: Darlene Aguilar is an Instructional Design Librarian at Loyola Marymount University where she designs and develops video tutorials and online modules on information literacy and library related topics. Additionally, she provides “best practices” training in instructional design to other LMU librarians. She graduated from the University of Southern California with a Master’s in Education for Learning Design and Technology and previously worked at LAUSD for 7 years. She strives to remove learning barriers that are embedded in instruction and curriculum and make learning accessible to all learners. What new kinds of leadership are required for this new teaching and learning landscape? What are the best methods and techniques that promote innovation and creative thinking to support student learning? What new educational technologies seem most promising? What role should data and analytics play, and what are the trade-offs between analytics and privacy? How can we best determine the efficacy of our learning innovations and technologies? Data visualization is about presenting data visually so we can explore and identify patterns in the data, analyze and make sense of those patterns, and communicate our findings. In this course, you will explore those key aspects of data visualization, and then focus on the theories, concepts, and skills related to communicating data in effective, engaging, and accessible ways. This will be a hands-on, project-based course in which you will apply key data visualization strategies to various data sets to tell specific data stories using Microsoft Excel or Google Sheets. Practice data sets will be provided, or you can utilize your own data sets. Basic knowledge of Microsoft Excel or Google Sheets is required to successfully complete this course. Resources will be included to help you with the basics should you need them, but time spent learning the tools is not included in the estimated time for completing this course. What are the key takeaways from this course?